2017- : Consortium manager Resource Recovery Technology Consortium. 2013-2017: Postdoctoral researcher (see below for project description). 2013: PhD in Applied Biological Sciences: Optimizing the plant microbial fuel cell: diversifying applications and product outputs. Ghent University, Belgium. 2009: MSc. : Biotechnology: specialization cellular/molecular, Wageningen University, The Netherlands. 2006: BSc. : Biotechnology, Wageningen University, The Netherlands. Jan studied the interaction of bacteria with the cathode of a bioelectrochemical system (BES) in the context of the Electrotalk project. As a model he used homoacetogens that are able to use electrons derived from an electrode to fix CO2 into multicarbon products such as acetate (vinager) or ethanol. This proces is also called microbial electrosynthesis (MES) and can potentially be used to store (excess) electrical energy into fuels (Desloover et al. 2012). In an initial study a process for enriching homoacetogens with minimal intereference of methanogens was described (Patil et al. 2015). In a follow project, this process was studied in continouse mode where the production of iso-propanol was obtained under specific process conditons (Arends et al. 2017). A part of this work also entailed understanding microbial kinetics which is particularly difficult to asses for anarobic microorganisms. Therefore, a new tool based on hydrodynamic chronoamperometry was compared with conventional optical techniques to assess substrate turnover to determine anaerobic kinetics in collaboration with Dr. Prévoteau (Prevoteau et al. 2015). The plant microbial fuel cell (PMFC) is a bioelectrochemical system that makes use of anaerobic bacteria that are able to turn organic carbon and solar energy exctreted by plants in the from of rhizodeposits into electrical energy. This system was studied within the EU-funded project 'PlantPower' for generating electricity and added (environmental) benefits in the context of sediments. Initially an overview was made on the possibilities and rationale for applying a bioelectrochemical system in environmental engineering concepts (Arends & Verstraete 2012). In a first experimental study, the type and ratio of electrode material to sediment was optimized (Arends et al. 2012). This information was used to study the hypothesis that a BES is able to mitigate CH4 (an important greenhouse gas) emisisons from anaerobic sediments. In this context several laboratory experiments showed that CH4 emissions could be postponed but not completely inhibited (Arends et al. 2014). A third study aimed to maximize the benefits of the PMFC by coupling a BES to the effluent of a constructed wetland where at the anode additional organic matter was removed and at the cathode H2O2 (a desinfectant) was produced. Using this configuration the wetland combined with the BES can be optimized to produce water suitable for re-use instead of only discharge (Arends et al. 2014). Schematic overview showing the concept of CH4 mitigation by means of a PMFC or a BES from anaerobic sediments. The plant captures sunlight and organic carbon that is deposited in the soil. In anaerobic conditions this can be transformed into CH4 but if an electrode is present, also electrical energy can be produced. When no plant is present, less electrical energy can be produced from anaerobic sediments. Jan is currently funded via the Resource Recovery Technology Consortium. Previous funding was received via the European Research Council Starter Grant no. 310023 'ELECTROTALK', awarded to Prof. Rabaey and via the European Community’s Seventh Framework Programme FP7/2007-2013 'PlantPower' under Grant Agreement No. 226532. T. Lacoere is thanked for making the scheme on CH4 mitigation. Arends JBA, Verstraete W. 2012. 100 years of microbial electricity production: three concepts for the future. Microbial Biotechnology 5(3):333-346. Patil SA, Arends JBA, Vanwonterghem I, van Meerbergen J, Guo K, Tyson GW, Rabaey K. 2015. Selective Enrichment Establishes a Stable Performing Community for Microbial Electrosynthesis of Acetate from CO2. Environmental Science & Technology 49(14):8833-8843. Arends JBA, Patil SA, Roume H, Rabaey K. 2017. Continuous long-term electricity-driven bioproduction of carboxylates and isopropanol from CO2 with a mixed microbial community. Journal of CO2 Utilization 20: 141-149. Arends JBA, Speeckaert J, Blondeel E, Vrieze J, Boeckx P, Verstraete W, Rabaey K, Boon N. 2014. 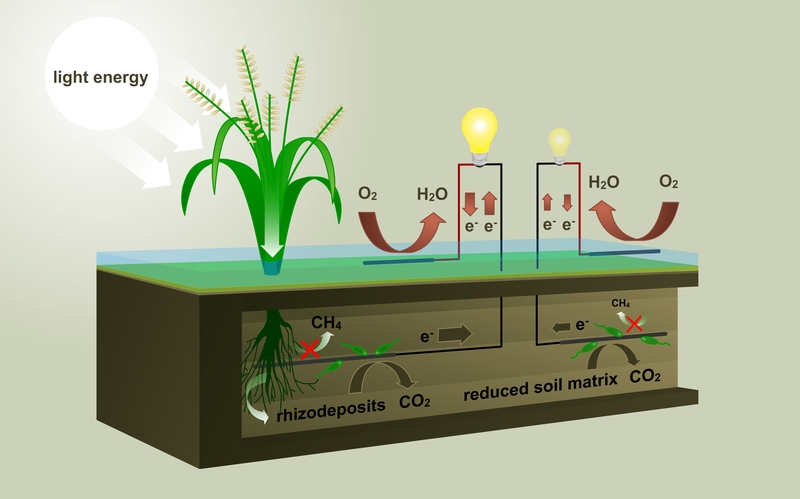 Greenhouse gas emissions from rice microcosms amended with a plant microbial fuel cell. Applied Microbiology and Biotechnology 98(7):3205-3217. Arends JBA, Van Denhouwe S, Verstraete W, Boon N, Rabaey K. 2014. Enhanced disinfection of wastewater by combining wetland treatment with bioelectrochemical H2O2 production. Bioresource Technology 155(0):352-358. Prévoteau A, Geirnaert A, Arends JBA, Lannebère S, Van de Wiele T, Rabaey K. 2015. Hydrodynamic chronoamperometry for probing kinetics of anaerobic microbial metabolism – case study of Faecalibacterium prausnitzii. Scientific Reports 5(11484):13.